Flexner, James Thomas. Washington: The Indispensable Man. New York, Boston, and London: Little, Brown and Co, 1976 . Parmet, Herbert S. Richard Nixon and His America. New York: Konecky & Konecky, 1990. Rappleye, Charles. Robert Morris: Financier of the American Revolution. New York: Simon & Schuster, 2010. Thane, Elswyth. The Fighting Quaker: Nathanael Greene. New York: Hawthorn Books, 1972. Tucker, Eric; and Sadie Gurman. “Yates firing sends a message about Trump’s dissent tolerance.” Washington Post. 31 January 2017. https://www.washingtonpost.com/politics/yates-firing-raises-questions-about-tolerance-of-dissent/2017/01/31/919c8636-e7fe-11e6-903d-9b11ed7d8d2a_story.html?utm_term=.99e02cb546cb. Last Accessed: 2 Feb 2017. Unger, Harlow Giles. “Mr. President”: George Washington and the Making of the Nation’s Highest Office. Boston, MA: Da Capo Press, 2013. Winston, Robert W. Andrew Johnson: Plebeian and Patriot. New York: Henry Holt and Co, 1928. After a debate over how much authority Washington would exert over its officers, the executive branch begins to take shape. I examine both the original Cabinet members and the departments as they were at the beginning of the constitutional government. Then, as Washington leaves town to take a tour of the New England states, a personal scandal becomes the talk of the town in New York City. Romantic liaisons, conflicts of interest, and strong opinions over postal routes are all to be found in this episode. Source information can be found at http://presidencies.blubrry.com. McGuiness, Colleen, ed. American Leaders 1789-1994: A Biographical Summary. Washington, DC: Congressional Quarterly, 1994. Washington, George. “To Richard Conway, 6 March 1789,” Founders Online, National Archives, last modified December 28, 2016, http://founders.archives.gov/documents/Washington/05-01-02-0279. [Original source: The Papers of George Washington, Presidential Series, vol. 1, 24 September 1788 – 31 March 1789, ed. Dorothy Twohig. Charlottesville: University Press of Virginia, 1987, pp. 368–369.] Last Accessed: 28 Jan 2017. Washington, George. 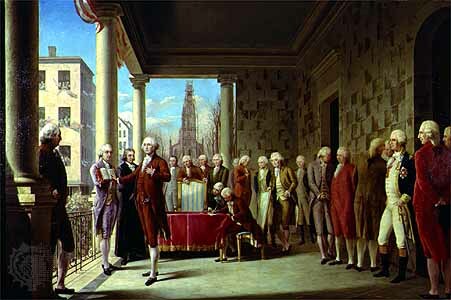 “Inaugural Address,” April 30, 1789. Online by Gerhard Peters and John T. Woolley, The American Presidency Project. http://www.presidency.ucsb.edu/ws/?pid=25800. Last Accessed: 25 Jan 2017. Washington, George. “To David Stuart, 26 July 1789.” Founders Online, National Archives, last modified December 28, 2016, http://founders.archives.gov/documents/Washington/05-03-02-0180. [Original source: The Papers of George Washington, Presidential Series, vol. 3, 15 June 1789–5 September 1789, ed. Dorothy Twohig. Charlottesville: University Press of Virginia, 1989, pp. 321–327.] Last Accessed: 28 Jan 2017. Washington, George. “To James Craik, 8 September 1789,” Founders Online, National Archives, last modified December 28, 2016, http://founders.archives.gov/documents/Washington/05-04-02-0001. [Original source: The Papers of George Washington, Presidential Series, vol. 4, 8 September 1789 – 15 January 1790, ed. Dorothy Twohig. Charlottesville: University Press of Virginia, 1993, pp. 1–2.] Last Accessed: 28 Jan 2017. Washington’s inauguration, while starting up the wheels of the executive branch, leaves many questions to be answered by the first chief executive and the new government. What titles will be used to address the president? How will he make himself available to the public and to the other branches of government? What does seeking “the Advice and Consent of the Senate” really mean anyway? So much of what we take for granted with the presidency nowadays is established in Washington’s first few months on the job, and these precedents that he established in the early part of his administration are the focus of this episode. Source information for this episode can be found at http://presidencies.blubrry.com. • Ambrose, Stephen E. Nixon: The Education of a Politician 1913-1962. New York: Simon and Schuster, 1987. • Balz, Dan; and Haynes Johnson. The Battle for America 2008: The Story of an Extraordinary Election. New York: Viking, 2009. • Bauer, K Jack. Zachary Taylor: Soldier, Planter, Statesman of the Old Southwest. Baton Rouge, LA: Louisiana State University Press, 1985. • Becker, Samuel L; and Elmer W Lower. “Broadcasting in Presidential Campaigns.” The Great Debates: Kennedy vs. Nixon, 1960 A Reissue. Bloomington, IN and London: Indiana University Press, 1977 . p. 25-55. • Berg, A Scott. Wilson. New York: G P Putnam’s Sons, 2013. • Brands, H W. Traitor to His Class: The Privileged Life and Radical Presidency of Franklin Delano Roosevelt. New York: Doubleday, 2008. • Chambers, William Nisbet. “Election of 1840.” History of American Presidential Elections 1789-1968, Volume I. Arthur M Schlesinger, Jr, ed. New York: Chelsea House, 1971. p. 641-744. • Cooper, John Milton, Jr. Woodrow Wilson: A Biography. New York: Alfred A Knopf, 2009. • Dallek, Robert. Lone Star Rising: Lyndon Johnson and His Times 1908-1960. New York and Oxford: Oxford University Press, 1991. • Goodwin, Doris Kearns. No Ordinary Time: Franklin and Eleanor Roosevelt: The Home Front in World War II. New York: Simon & Schuster, 1994. • Goodwin, Doris Kearns. Team of Rivals: The Political Genius of Abraham Lincoln. New York: Simon & Schuster, 2006 . • Goodwin, Doris Kearns. The Bully Pulpit: Theodore Roosevelt, William Howard Taft, and the Golden Age of Journalism. New York: Simon & Schuster, 2013. • Harris, John F. The Survivor: Bill Clinton in the White House. New York: Random House, 2005. • Kranish, Michael; and Marc Fisher. Trump Revealed: An American Journey of Ambition, Ego, Money, and Power. New York: Scribner, 2016. • Malone, Dumas. Jefferson the President: First Term 1801-1805, Jefferson and His Time Volume Four. Boston, MA: Little, Brown and Co, 1970. • Meacham, Jon. Destiny and Power: The American Odyssey of George Herbert Walker Bush. New York: Random House, 2015. • McCullough, David. Truman. New York: Simon & Schuster, 1992. • Morris, Edmund. Theodore Rex. New York: Random House, 2001. • Newton, Jim. Eisenhower: The White House Years. New York: Doubleday, 2011. • O’Brien, Michael. John F Kennedy: A Biography. New York: Thomas Dunne Books, 2005. • Seale, William. The President’s House: A History, Volume One. Washington, DC: White House Historical Association, 1986. • Shafer, Ronald G. The Carnival Campaign: How the Rollicking 1840 Campaign of “Tippecanoe and Tyler Too” Changed Presidential Elections Forever. Chicago: Chicago Review Press, 2016. • Shlaes, Amity. Coolidge. New York: HarperCollins, 2013. • Socolofsky, Homer E; and Allan B Spetter. The Presidency of Benjamin Harrison. Lawrence, KS: University Press of Kansas, 1987. • Trefousse, Hans L. Andrew Johnson: A Biography. Newtown, CT: American Political Biography Press, 2009 . To mark the occasion of the 45th president’s first speech to a joint session of Congress, I present to you this special episode on how presidents have communicated with other politicians and government officials as well as with the general public and how this has changed both with the advent of new technologies and with the varying personalities of the chief executives. From George Washington’s public levees and national tours to Abraham Lincoln’s effective use of the telegraph, from Theodore Roosevelt’s bully pulpit to the Johnson treatment, and from the installation of the White House telephone to the current president’s use of Twitter, this episode covers a great deal of ground. Sources used for this episode can be found at http://presidencies.blubrry.com.